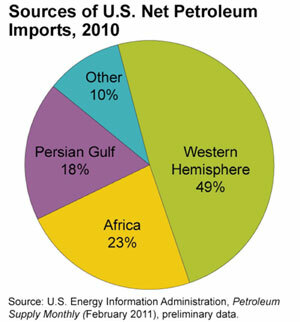 Petroleum is the basis for oil products and gasoline production. 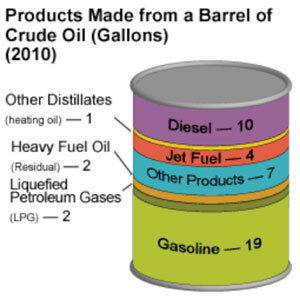 Through refining, petroleum is converted into a variety of products, mostly related to transportation fuels. 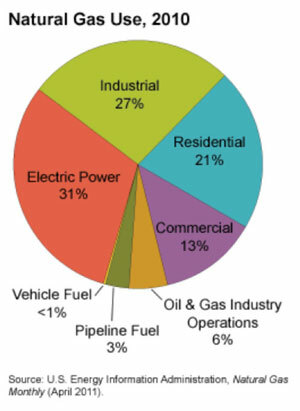 Natural gas is used to heat slightly more than half of the homes in the United States, but 31 percent of the supply is also used to generate electricity. Natural gas is used in industrial manufacturing as an input in agriculture-related products, such as nitrogen fertilizers, and to make plastics. supply in the United States comes from coal. 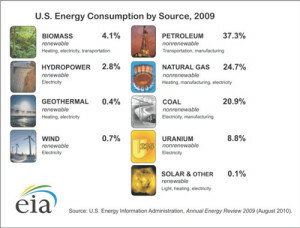 Renewable energy makes up about 8 percent of U.S. total energy supply and was about 10 percent of the electricity supply in 2010. Hydropower is the largest renewable energy resource, representing 31 percent of the supply. 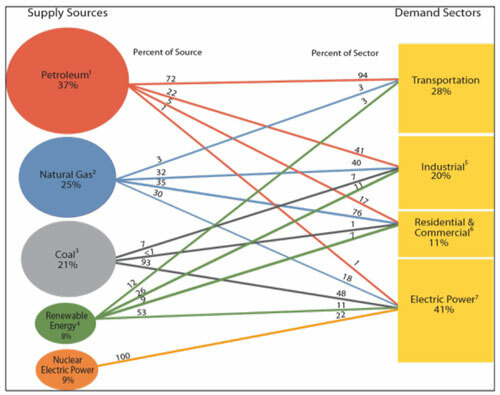 Another way of considering sources and uses is in the graph below, which shows the primary sources of energy and the primary demand sectors (users) of energy in the U.S. 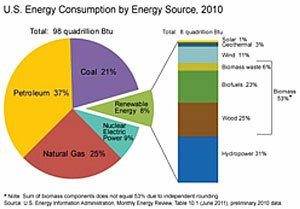 This graphically illustrates many interesting things about the way we use energy. For example, we can see that 94 percent of our transportation fuels come from petroleum sources – meaning that we have few options to “switch” to other sources of supply when petroleum prices change or if the supply chain were compromised. 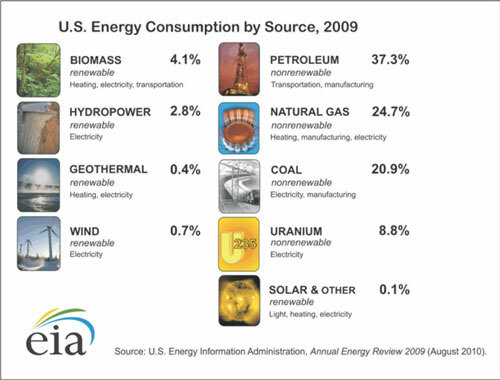 According to The U.S. Energy Information Administration, the type of energy consumed the most in U.S. homes is natural gas (45 percent). 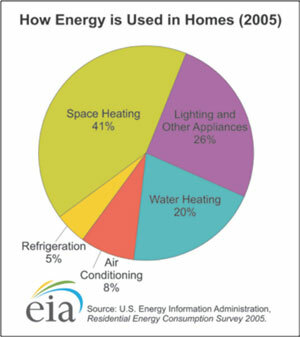 Most of the natural gas is used for space heating. 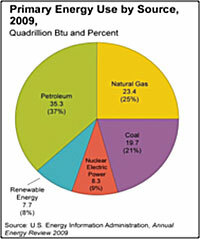 Electricity comes in second at 41 percent. Most of the electricity is used for lighting and appliances. The statistics are similar for homes in Montana and Wyoming. For Montana homes, the greatest amount of energy consumed is natural gas (44 percent). Most Montana and Wyoming homes heat living space with natural gas. It is used also for heating water. The second most common energy type is electricity at 32 percent of the total used. The relevance of the sources and uses of energy often relates to your objectives in exploring energy alternatives. For example, if your primary objective in making changes to your energy consumption is to reduce dependence on imported sources of energy, you should focus on reducing or producing transportation fuels. If your objective is to reduce fossil fuel consumption, you may wish to consider your largest use of fossil fuels as a place to start. 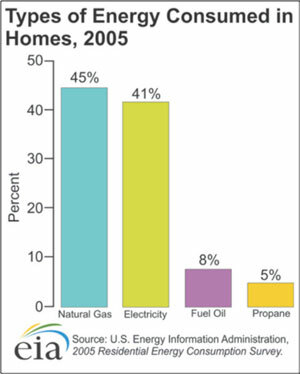 Is personal consumption higher in transportation fuels or natural gas consumption for heating your home? Understanding what energy sources you are using and how those sources and uses relate to your objectives can help you to align your energy goals.